The next Smash Bros., Super Smash Bros. for Wii U and 3DS, will be featuring newcomers like Mega Man, the Wii-fit exercise instructor, and the latest announcement from E3, Pac-Man. But, much like the newly announced Mii Warrior, this wasn't the first opportunity for him to join the Smash Bros. cast. 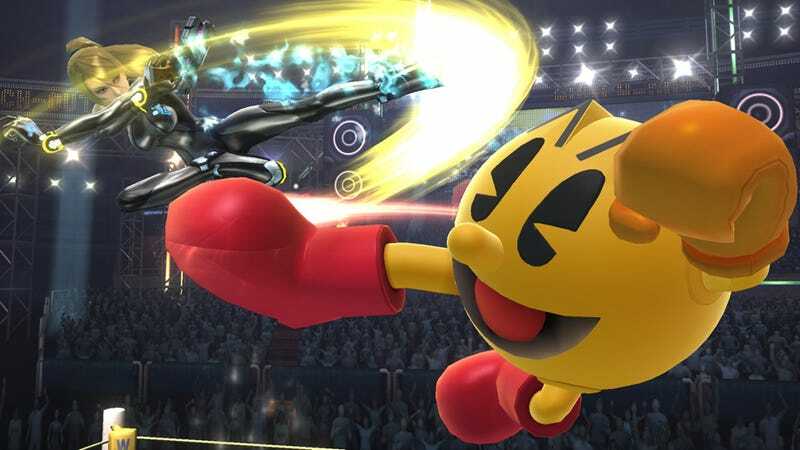 In his semi-weekly column in Weekly Famitsu, series creator Masahiro Sakurai revealed that, much like the player-created Mii Warrior, Pac-Man was almost a guest character in the Wii game, Super Smash Bros. Brawl. "During development of Smash Bros. Brawl, Mr. Shigeru Miyamoto of Nintendo approached me and asked, 'Can't we have Pac-Man as a guest character?'" Sakurai recalled. "At the time, imagining the image of Pac-Man and his incomplete pizza shape, I thought to myself, 'Hmmm... That's a little too farfetched.'" As Sakurai explains, coming up with an idea and actually making it a reality are very different beasts. While it's easy to imagine a character in a Smash Bros. game, on the dev side, there's a lot more to consider. "How to give the character their own individuality as a fighter and how they'll move. Should the game system maintain a consistent form or not. What other fighters are there and how will the new character differ in strategy? Does the new idea fit with the original game? Most importantly, is it entertaining?" Given the amount of creative work that needs to go behind adding a new character, it's no wonder Sakurai originally turned down the idea. And yet, now, nearly 8 years later, there's Pac-Man. Fairly fitting, considering that Bandai Namco is developing the new game. "You never know what's going to happen in this world." Sakurai remarked. "I'll just keep my mouth shut. That's a good idea."